Realworld paint is a portable image editor with raster and vector layers and layer styles optimized for bloggers and other web publishers. The editor can import and export photoshop, gimp and paint. Net files with layers ad use photoshops.8bf plug-ins. There are numerous drawing tools like brush, line, curve, ellipse, rectangle or flood fill and specialized photo-retouching tools like crop (with perspective removal), clone or shape-shift (liquify equivalent). The editor also supports animated gifs and contains a built-in gif optimizer. Users may download additional language packs, layer style, image brushes, pattern fills or bumpmaps. 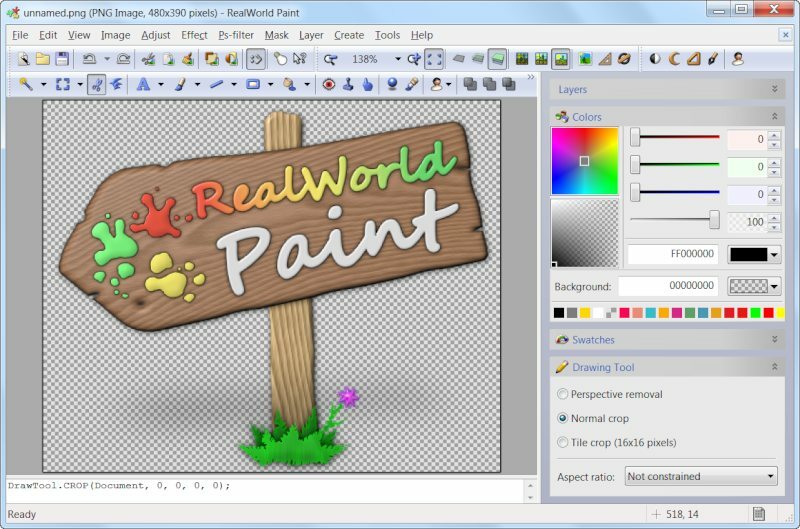 RealWorld Paint is an utility that works under windows xp, windows vista and windows 7. It supports both 32-bit & 64-bit windows editions, therefore it could run faster on 64-bit computers. It is Free so you can download it and share it with your friends. Estimated download time for RealWorld Paint on a common adsl connection is less than a minute. Version 2013.1 was released two thousand two hundred twenty six days ago by RealWorld Graphics. Click the green download button to download it now.